Hettie Honey picked up a lovely lavender lace weight that a customer had abandoned by the till after pondering for what seemed like an eternity that, actually, it wasn’t the right shade of lavender after all. She then walked across the shop floor of her House of Haberdashery to repatriate the ball into its rightful place—a wooden, floor-to-ceiling cabinet comprising twenty-four cubbyholes inset over three shelves crammed with every color, ply and type of yarn imaginable. Hettie smiled wryly, remembering the program she had listened to on the radio not so long ago. Knitting! It was all the rage nowadays and she hoped it would finally catch on in Tindledale, her beloved picture-postcard village and Hettie’s home for the eighty-three years of her life to date. She ran the timber-framed, double-fronted shop adjacent to the wisteria-clad roundel of the oast house her father had built before she was even born. Hettie lifted the tray on which sat the last remnants of her afternoon tea; a cheese sandwich minus the crusts because her teeth weren’t as strong as they used to be plus a pot of tea and a pink iced finger that had only cost ten pence on account of being past its best. Kitty, in the tearoom up on the High Street, had tried to give her the bun for free, but Hettie hated taking charity, especially when she felt there were other people in far more need. Hettie moved to the back of the shop, swept the curtain aside and went through to the little kitchenette area. Years ago this had been her mother’s sewing room, and the wooden Singer machine with its rickety foot pedal still lived there, with a multitude of multicolored bobbins all piled up high on the shelf behind it. After placing the tray on the draining board next to the age-veined Belfast sink and carefully wrapping the crusts in plastic to dunk into her warming homemade soup the following afternoon, Hettie picked up the picture frame on the mantelpiece above the fi re and ran a finger over the faded black-and-white autographed photo. She allowed herself an enormous sigh. She wasn’t usually one for self-pity or hand-wringing, but another one of the letters had come this morning, with FINAL DEMAND stamped across the top in ugly red type. Business had been so slow these past couple of years, and now, with her dwindling savings and pittance of a pension, she had come to realize that it was going to take a darn miracle this Christmas for Hettie’s House of Haberdashery to remain afloat come the new year. There had been talk of retirement; of closing down the House of Haberdashery; of putting her feet up and going “into a home.” Hettie’s nephew, her brother Harold’s son and last of the Honey family line, was all for it. On one of his rare visits, on the pretext of seeing how she was, he’d told Hettie he was concerned about her living on her own, that she needed the rest and that “it’s not like you’ve got that many customers these days, is it?” He said he’d make sure she had her own bedroom or at the very least, a twin sharer. “And besides, it might be nice for her to have the company of people her own age.” He’d put forward a strong case and had already contacted the council to inquire about a suitable place. But Hettie wasn’t losing her marbles and she knew that what he was really after was to bulldoze her beloved home—the oast house surrounded by a meadow of pretty wild flowers, and the place where she grew up. There’s her cozy bedroom suite, set upstairs in the roundel with its magnificent view of the valley, the lovely farmhouse kitchen with the walk-in pantry, the sunroom, the snug—it’s got the lot, and that’s on top of all her memories wrapped within its circular walls. Not to mention her beloved little shop, right next door, crammed full of all her favorite knitting and needlecraft goodies. Then he’d be able to get his hands on the land for one of his building projects. He’d told her all about the one with ample parking and plastic windows that his company had created in the town where he lived, over fifty miles away. Seventeen months it had taken, he’d said, to fight all the objections from the local residents’ association, and he had puffed on about it for the entire hour of that tedious visit. But Hettie isn’t ready to be written off; to be carted away to an old people’s home like a nag to a glue factory, not when there is plenty of life still left in her sprightly body. Besides, “going into a home” would mean leaving Tindledale behind, and Hettie knows more than anything that this is where her heart belongs. It always has, even when she’d had the chance of a different life, far, far away. 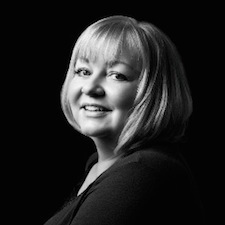 Alexandra Brown began her writing career as the City Girl columnist for The London Paper – a satirical diary account of her time working in the corporate world of London. Alex wrote the weekly column for two years before giving it up to concentrate on writing novels and is now the author of the Carrington’s books. Set in a department store in the pretty seaside town of Mulberry-On-Sea, the series follows the life, loves and laughs of sales assistant, Georgie Hart. The Great Christmas Knit Off is Alex’s fourth book and is the first in a new series set in the fictional village of Tindledale, following the lives of all the characters there. Links to Alexandra’s website, blog, books, etc. Good morning, Alexandra, and welcome to Karen’s Killer Book Bench! 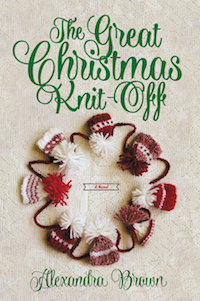 I love Christmas stories and had a wonderful time knitting and crocheting my way through life. I’ve had to give up the hand work thanks to arthritis but can still enjoy this wonderful story. Thanks so much for sharing your new release with us! Your book sounds like fun. I can crochet and knit but I am only average. I taught my daughter to knit and crochet and she just took off. I think if I win a book, I will give it to her. But only after I read it, of course.